I did an equipment swap with another weaver at Weavolution.com. When I went up into the highlands a few months ago, I bought a bunch of Bolivian drop spindles at the market and then offered them at Weavolution in return for stuff that I can’t get here in Bolivia. An offer was made to adopt my last drop spindle and we negotiated the swap-cotton sliver in indigo, terracotta and natural. I learned to spin cotton in Ecuador a couple of years ago and have gone through my small quantity of raw material. Santa Cruz used to be an important cotton producing region in the old days but not a single boll to be found now. So I jumped at the chance to get this sliver in such gorgeous sounding colors! My package arrived and this is what I found! Okay, now you can see why I am so excited! Yes, I got my gorgeous sliver. The white stuff in the middle is, in fact, tussah silk! A teeny spindle was included and there below……..TWO RIGID HEDDLES!! It is like she read my mind. 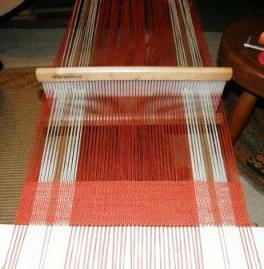 I have been wanting to weave with a rigid heddle on my backstrap loom for a long time. WHY?-when I know all these wonderful intricate pick-up weave techniques? What I wanted to do was show knitters, spinners and other never-ever weavers that backstrap weaving is not only about warp-faced fabrics with pick up patterning. 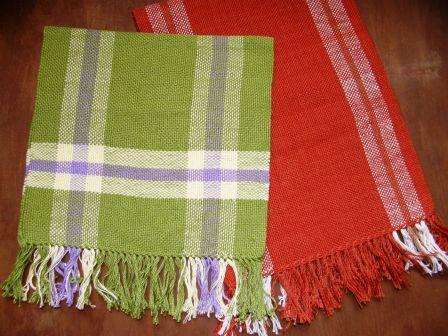 You can also weave balanced weave textiles and produce kitchen towels, scarves, table runners, placemats-all the things that we like to make on our rigid heddle looms. I was also aware that most of the ready-made backstrap kits available come with a rigid heddle- so I really wanted to try it out. Now, I have tried balanced weaves on my backstrap loom without a rigid heddle with success-a log cabin piece, a simple pin wheel and a twill using three heddles but it is really fussy. You have to be constantly watching the warps as they want to stray over into warp faced. You end up unweaving and adjusting as the width varies too. Yes, it is do-able but the word TENACITY springs to mind. It was a breeze with the rigid heddle. 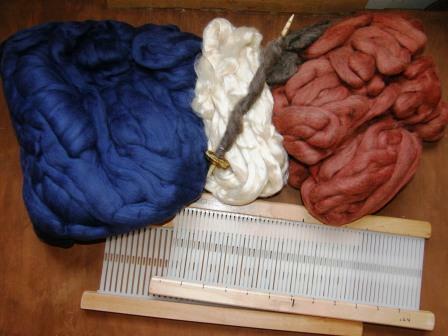 I used 8/2 thread doubled in the 10dpi heddle and made two lovely cloths. I am stupidly excited about being able to make something that feels like ”cloth”!-as opposed to my complementary and supplementary warp-faced weaves which are more on the stiff side. Yes, those fringes are a bit unruly but they will be trimmed. I have already found good use for these two projects. ”Camba” is the name for people from Santa Cruz. The green cloth lines my basket of ”cunape”. 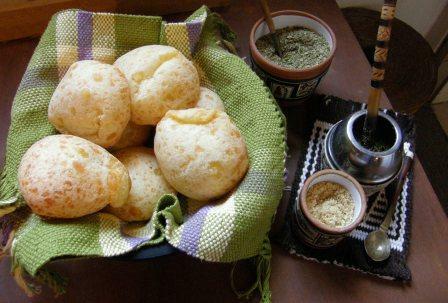 These cheesy bread rolls are a typical breakfast or tea time snack. The ”gaucho” or, Argentinean, part of this set up is the ”yerba mate” . Yerba mate is a kind of tea typical of Argentina and Uruguay. You put the leaves in the small silver pot, add hot water and sugar and sip it through the wodden straw. There are many different ways to prepare it. I can take it or leave it but some Argentineans are totally addicted to it and go around everywhere with their pot and thermos. The pot is usually shared with a group-passed around with each person taking a sip. And here is the red cloth in action…………. 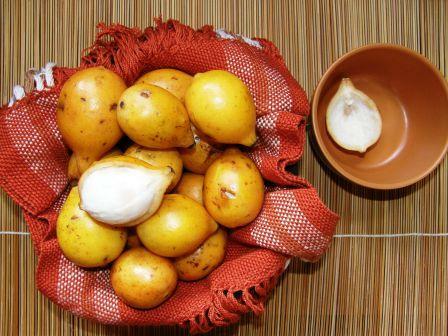 achachairu-every good ''camba's'' favorite fruit! This fruit is in season now, but beware, they are very acid. My teeth ache for days after eating these! So, if you are thinking of taking up weaving and are interested in trying the portable, inexpensive backstrap loom, you can add a rigid heddle for under $30 to your equipment and make these lovely balanced weave pieces. Now to get back to the highlands, get more spindles and see what other goodies show up in the mail! hi ,Laverne ,I was already courious about your blog since you mentioned it on Flickr. Thanks Laverne, I have been thing about doing the same with a small rigid heddle. What did you do with the ends as you had to cut one end to thread through the holes? Just tie in groups around the bar attached to the backstrap? Yes, I had to cut the ends of course. The prospect was not pleasing as cutting is not necessary with string heddles, as you know. However, it was quite easy. 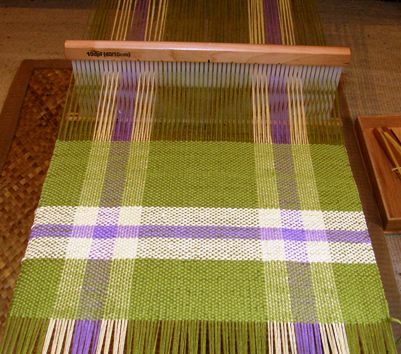 I strapped in and set up the heddle over the warp using two small stools on either side of the warp and clamps. I actually tied each and every warp in a knot around my bar rather than tying them in groups as I figured there would be less warp waste that way and I could get a good clean start. I”ll post a photo of the set up with heddle clamped the next time I warp up. Congratulations, Laverne on your brand new blog. You fill a niche for weavers everywhere. Thank you and welcome to the niche ML! Great start to your blog! The towels are beautiful and seeing them at work on the table really brings life to the process. You have some great cotton there for spinning too. Thanks for the invite to your blog. Hi Franco! Thanks so much for dropping by. Wow, I can see why you were excited to get such a great package in the mail!! Hope the spinning is going well. I haven’t started spinning this cotton yet. I think I need to get my hand back in with some ”rough” stuff. This cotton is just too too lovely to risk! Congratulations on biting the bullet! I’m sure this will be one of the most popular blogs on the net! And I thought that weaving was such a simple pleasure. I can see from your blog that there can be so much more. Love the gaucho breakfast picture. Beautiful photography. Thanks for the invitation, Laverne. Congratulations on your new blog! It looks great! Looking forward to reading about your adventures. Great to see a nice big copy of the photo of you at the loom, with the Guarani piece. That is an amazing weaving! Do you know how many hours you put into that one? Thanks for visiting Aunt Janet. I think the Guarani piece took 3 weeks working 2-3 hours a day. Pebble weave is a bit faster than the other pick up techniques I know as every second row is loom controlled. I told my friend in Utah that I would make a bookmark for him but somehow the message got crossed and I heard back from him saying how happy he would be to have a wall hanging from me and that he had reserved the perfect spot for it!! very funny when internet helps !!! So nice to see your blog. I’ll be looking forward to reading your posts. It’s lovely to see your cloths in action. It is inspiring. When I become a bit more proficient in warp-faced weaving, I’m going to have to try balanced weave. Do get your blog going again Filomena and give me the address so I can put you on my blogroll. You have all your new backstrap experiments to write about! I am so excited about your blog. I have been enamored of the hispanic culture for many years now – studying Spanish and visiting Latin America countries (Peru, Costa Rica, Mexico). And I love weaving too. So – your blog is the perfect combination of both. Can you tell more about “going to the highlands”? Were you born in Bolivia? If not – what brought you to be living there now? oh – I have a million questions, but I’ll stop there. Congratulations, you said it, and you did it !!! Well, now you just have to tell us because we are waiting to read… and please, don’t make us jealous we all are curious to know your long story !!! I have added a page about my journey to Bolivia just for you(!) As for pebble weave, the weaving on my blog header, the Guarani piece and the red weaving in the invitation I sent you are all done in pebble weave. This weave is characterized by the little spots, or pebbles, that you can see on the surface. muito muito obrigada Laverne ! ok, I’ve seen what is pebble weave, now I’m just waiting (patiently…) for learning this technique !!! As for the special page on your journey… rendez-vous on this page ! Thank you so much for visiting and for your support. Hi, Laverne. I’m so excited about your new blog! Thanks for being here. I have you on my blog roll! I just blogged about receiving my two new Beka rigid heddles. You’re quite an influence! Hi ! just me again ! do you know about this technique ? hmm, that should function better !! Isn’t that spectacular!! 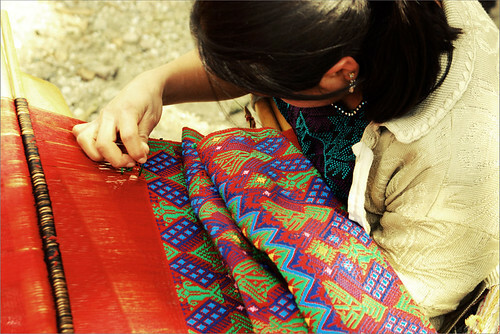 I learned some spplementary weft patterning with two teachers in Guatemala but nothing as intricate as that! I suppose it is a matter of taking the basic technique and exploring with it. Thanks for that lovely link, Michelle.